Pumaspeed have the answer to the two inherant weaknesses found in the Ford OE 1.6 EcoBoost Engine Block! All engine blocks from 2011 to 2018 have very thin and substandard cast in liners. These liners do not go all the way to the Deck Plate but stop short of the deck by approx 5-6mm. The top 5-6mm is Aluminium so not as strong as steel or iron and Ford, in there wisdom, decided it would be a very good idea to weaken this alloy area even further by machining a groove in between each Piston on the deck itself. We first produced a block modification Shim that cured the Deck movement on even stock powered cars, but now with cars having 350-420bhp, it seems not even this simple Shim idea is good enough. We have found that the original Cast in Iron / Steel liner has now decided it would also like to join the party and crack down its length. The crack starts at the very top where it is thinner rather than thicker, where the strength is needed. So what do we do the fix this problem? 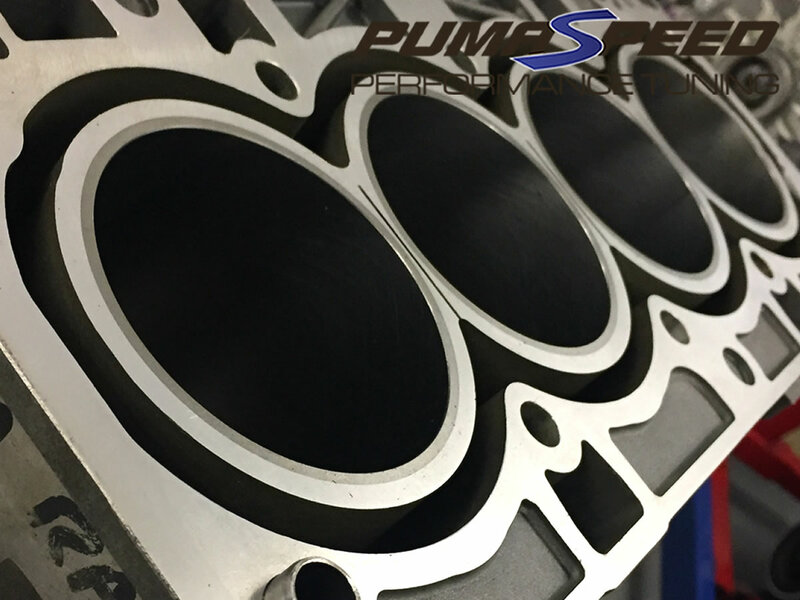 We take a customer supplied Engine Block with cracked or deep scoring damage and have the full set of 4 Ford Liners fully machined out. The holes are then enlarged to take a new Ductile Liner System that is much thicker and stronger than the original, as well as taller so that the Block Deck sealing areas now become Iron rather than weak Alloy. Obviously, there is way more tech to doing this and all surfaces are prepped, cleaned and fully machine resurfaced again, making this block as close to OE Spec new as possible. We can supply the bore as 100% stock OE or larger for over sized pistons, we have even done a smaller bore version to suit the Omega pistons that are 2 though under sized. Are the Blocks better than having the Closed Deck System fitted alone? Almost certainly yes, the Closed Deck by itself does not address the fact that the Stock Cast in Ford liner is simply too thin and weak, its almost certain that under prolonged competition use, that the Stock Ford OE Block will eventually fail by the deck warping or by the liner cracking. We do require a used and suitable Bare Engine Block as exchange for swap over but as we have these in stock ready to go, we do not need it immediately. The Block can have some very serious wear internally to the Bores but cannot have any outer damage which would render it unusable by you or the next customer. It must have the Crank Cradle still fitted with all the bolts in place. This engine block provides an Engine Builder a perfect fresh start and does not include crank rods or pistons which are available in various versions from our webstore. If in doubt, please call us with images and we will advise! Pumaspeed have a specialist distribution team that can dispatch the Pumaspeed Bulletproof 1.6 EcoBoost Engine Block to any destination worldwide.